I took this recipe to a bridal shower this past weekend to share. Somewhere between there and here it went missing. !!!! I was horrified when I realized that today and was utterly relieved when I found that I'd posted it previously on my old website. whew! But I thought I'd post it here now so that my recipes are all together. source: Biscuits and Scones: 62 Recipes from Breakfast Biscuits to Homey Desserts, by Elizabeth Alston (Clarkson N. Potter, Inc./Publishers) page 15. Heat oven to 425 degrees. Put cornmeal, flour, baking powder, and salt into a large bowl. Stir to mix well. Measure maple syrup in a glass cup measure. Add milk to the 2/3 cup mark. Add butter to the flour mixture and cut in with a pastry blender or rub in with your fingers, until mixture looks like fine granules. Add the milk mixture and stir with a fork until a very soft dough forms. Drop 1/4 cupfuls of dough 2 inches apart onto an ungreased cookie sheet. Bake 12 to 14 minutes, until pale golden brown. Cool, loosely covered with a dish towel, on a wire rack. Aloha mai Nai`a, expat Canuckistanian... does it show? yah, maple is a must. 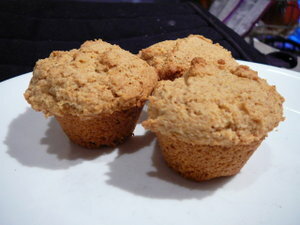 i put them in muffin tins in an effort to make them less crumbly. but you're supposed to just plot them on a sheet and cook'em. so they'd look like our version of biscuits if i'd shaped them that way. here scones are usually triangular and sorta flattish (inch or so high). Looks like I might have to make some scones and post them on my site rofl Ivy will know what I am talking about..Hey Meg didn't you have any scones with jam and cream with a cup of tea when you were in England? Cool - no eggs? Are they fluffy inside? How come its not raining these from the sky when I go to Vermont? well, i wouldn't say they're fluffy on the inside exactly. they're not dense, but they are crumbly (which doesn't mesh with fluffy in my mind). i'm trying out cooking them a little longer than i usually do and they're a little less crumbly, but i think i like the light crumbly mouth feel better than the dryer, more cooked one. yeah, we had scones at Roz's mom's tea as well as when we had tea down in London. they were just like the scones I get here (I should qualify that to say that I never buy the overly sweetened, covered with icing crap that some stores sell here.) except they were round instead of triangular. but the substance was the same. You don't ice scones, coffee buns have icing but never scones. The sweet ones are usually fruit or date scones, other than them I never add any sweetner to my scones. /me loves StarBucks' Maple Oat Nut scones, complete with MAPLE icing! Right up to the point that StarBucks admitted that just about everything they offer for sale in the bakeries was loaded with TransFats. Aloha mai Nai`a... who's daily *$s habit is in the $4+ range. scones are denser/heavier than biscuits, if all went well. Remember, it's in EVERYBODY'S eggs!